It appears that 2016 may be a repeat of the previous year when it comes to springtime floods. In 2015 the flooding came in early June and had a noticeable effect on our summertime fishing. Since June is the month when the summer patterns set in both for inshore and offshore fish, let’s take a look at what took place and try to determine if we will see a repeat situation. In 2015, the deluge of water came a month later than this year; however, all indications are that this year’s flooding involved considerably more water than that of 2015. First, let’s take a look at how the Galveston Bay Complex was affected. 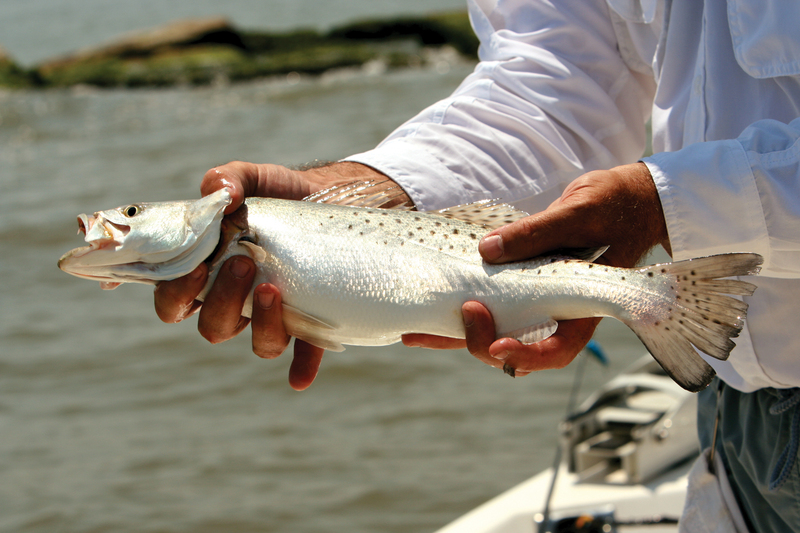 Areas in Upper Galveston and Trinity Bays lost practically all of the salinity in their waters, thus driving those fish that we call “salinity sensitive” species, largely speckled trout, toward the passes to the Gulf and the beachfront. Lower Galveston Bay, parts of East Bay and areas around both San Luis Pass and the Galveston-Bolivar Jetties held large numbers of specks all summer. A mild drought from late July to well into September helped return the waters in the upper reaches of the bay systems to near normal and a slow return occurred. By fall, fishing conditions were back to normal and anglers accustomed to the fine fall fishing in Trinity Bay enjoyed a productive season. Several of the fishing guides around the Galveston Bay Complex said that last summer they experienced some of the best trout action in years as a result of the concentrations in the lower extremities of Galveston Bay. How was the offshore fishing affected? When the big push of water occurred in early June, it was at a time when the pelagic fish were making their way to their summer homes closer to shore. From early June until sometime past Labor Day, schools of king mackerel, ling and Dorado could be found within easy range of the smaller fleet of boats commonly called the Mosquito Fleet. When all of the runoffs hit the Gulf, it was during this annual migration and a large number of our pelagic fish headed farther out into the deeper, more salinity-balanced waters and remained there most of the season. Most of the Mosquito Fleet fishermen reported slower action during the summer of 2015, as the range for most of the boats is less than 50 miles from shore. Dorado catches were down and part of the reason was the lack of seaweed in the nearshore Gulf. Was flooding the culprit in keeping the patches and lines of seaweed farther out? It possibly was. Now, what does our crystal ball say for this summer? For inshore fishermen, expect to see a continuation of the pattern of last year. If little rain falls during the early part of the summer, salinity levels in the upper reaches of the bay systems should return to normal. If so, expect to see speckled trout action to return to those areas later in the summer. On the offshore scene, many of us are hopeful that most of the flood waters will have dissipated by June and allow a normal migration of our summertime fish to the nearshore waters. The key to this will be a normal pattern of rain for May and June. If more heavy rain comes, then we could see a rerun of last year’s fishing patterns.